Just got this message from Michael’s Santa Monica, one of my favorite places for super delicious and romantic dinners. The perfect, candle-lit spot for couples to ring in the New York–or to give her a ring…. Come celebrate New Year’s Eve 2009 with an awesome party at Michael’s Santa Monica. The joint will be jumping, looking more beautiful than ever. The drinks will be flowing, with Champagne included with your meal. And the kitchen, led by executive chef Mikey Stern, will be humming, producing special menus featuring our renowned fresh, seasonal, regional California cuisine. General manager Mike Nicol and sommelier Andrew Turner will provide great service and wine advice about our award-winning wine list. For reservations, please phone Michael’s Santa Monica at 310-451-0843. Or make your reservations through . Tables are limited, so please book quickly. We hope to see you here for a great New Year’s Eve Party! This email was sent to ppietschma@aol.com by info@michaelssantamonica.com. When I stepped into the new Miyako Hybrid Hotel it felt like I’d left LA and gone to Japan. 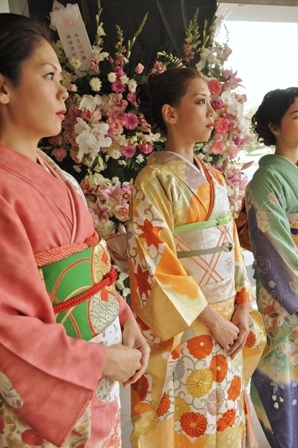 Gracious kimono-clad receptionists greeted us softly with welcome smiles. The lobby speaks the Orient and everything about the highly-stylized 208-room reflects a yin and yang serenity. Hard to fathom such graciousness smack amid a bustling commercial area in Torrance, California, 25-minutes from downtown Los Angeles and a stone’s throw from LAX. We actually went to the hotel to sample the much touted Gonpachi Restaurant Sushi Bar & Lounge. We decided to tie it in with an over-night to see exactly what a “Hybrid Hotel” was all about. The whole experience proved rather pleasant. Your basic business traveler facility, there’s no pool or recreational facilities, but a spa and fitness center are in the works, and there’s free Internet connection, two computers available to guests, and shuttle service to and from the airport. Unless you’re doing business at one of many Japanese corporations (Toyota, Honda and the like) that line Western Avenue, or need a place to plop on a LAX layover, you might be better off just going to Miyako to sample the Japanese fusion cuisine offered at Gonpachi. The Diva loved her room. 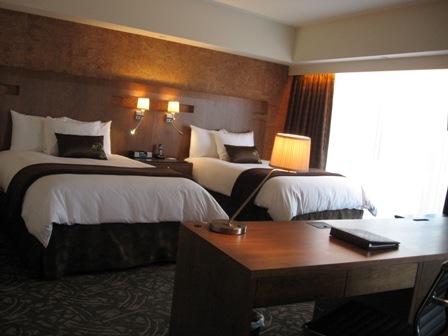 Comfortable and beautifully appointed , the bed actually engulfed us into a wonderful night’s sleep. Nice touches include coffee makers, ultra fine linens, 46 inch flatscreen TVs, , luxurious soaking tubs in which I indulged for a long bath, heated water bidets, and a special system that shuts off electricity when you leave the room (with the exception of a special plug for cell phones etc). The management prides itself on being “green” and makes special other efforts such as labeling trash baskets for recycling and changing sheets every three days. We sampled Gonpachi early in the game—it had opened only two weeks prior to our visit, December 2, 2009. We were told the menu and the wine list weren’t yet completed. Named after “Shirai Gonpachi”, the main character of a Kabuki, a form of traditional Japanese Theatre, the restaurant has an authentic edge. We ordered several items and enjoyed every attractively presented bite from the house, hand-made soba and udon noodles, to plates such as Sunomono –thinly sliced japanese cucumber in tosazu, Meiji Tofu, silken tofu with shibazuke sauce, crispy fried chicken with ponzu sauce, Gindara Saikyo Yaki–grilled miso-marinated black cod, kobe beef and mushroom cooked in hoba leaf (this was particularly fantastic), mixed seaweed : sweet sesame vinaigrette, Red Snapper Carpaccio with blueberry, garlic chips and yuzu kosho(also amazing), Kobujime–thin sliced halibut sashimi on kelp with daikon radish and red chili peppers (couldn’t get enough of this but had to save room), Flying Dragon–spicy tuna roll topped with unagi tempura and guess what? Cheese cake for dessert that was outstanding. It‘s definitely worth checking out when you get a yen for really good Japanese cuisine. And, if you’re really into all these Asian, check out the adjacent Mitsuwa Marketplace—where you can pick up anything from Japanese spices to fresh fish, takeout food, clothing and even Shiseido cosmetics. Miyako Hybrid Hotel, 21381 S. Western Avenue, Torrance, 310-212-5111, www.miyakohybridhotel.com. Since I’m sure you’re curious, “Hybrid” according to the company suggests eco-friendliness which is carried through with solar-powered electrical system, environmentally responsible and recycled construction materials. Miyako refers to “a flourishing center of business and entertainment.” Miyako Hybrid is the newest member of the well-respected Japanese hospitality chain. The Diva, draped appropriately in silk and designer duds, felt right at home as she walked through the extravagant entrance of the Grand Del Mar, a $300 million, and 249- deliciously comfortable room resort situated in northern San Diego County. Although its about as opulent as it gets, there is no sense of pretentiousness evident. Highlighted by a vibrant Mediterranean-Roman pan tiled roof and finely-tuned touches such as cast stone, copper, layered light, custom woodwork, glazed tiles, the resort conveys a surprising down-to-earth ambiance. I usually pick up a sense of a place from the check-in experience—which moved seamlessly from arrival at the elegant entrance where the attentive valets whisked our bags and escorted us to our posh Palazzo suite–a magnificent two bedroom affair with a huge balcony overlooking the golf course and mountains. We were welcomed with champagne and snacks set neatly on the wet bar which separated a little area with a microwave and mini-fridge. Upholstered ceilings—a décor touch new to us—hinted at the unadulterated opulence of suite. Marble counter tops, gold-colored fixtures, rich woods, Italian linens, a sumptuous sofa, comfy chairs, flat screen TV, king bed, two full bathrooms with tub, shower, big, fluffy robes, slippers and upscale spa amenities completed the leit motif. After we unpacked we walked around the interior which was decorated like a Christmas wonderland with gorgeous Yule time trees, poinsettias and lavish decorations. Even the outside areas were decked out for the season with more Christmas trees and ornamentation. We checked out the spa, a comfortably lavish facility with men’s and women’s areas. The female side provides peace and serenity with a gorgeous fireplace warmed lounge area appointed with canopied lounges, steam, sauna, lockers, Jacuzzi and of course showers and toiletries (all complimentary for guests). The adjacent spa pool was so inviting we aborted our tour to go get our swim suits. We took a soak in the oversized Jacuzzi, which is surrounded by cushy lounges, did laps and headed into our respective spa areas for steam baths. I picked up the extensive, uniquely-designed spa menu and must confess the prices were a bit shocking with facial therapies starting at $175 to $270 plus a 20 percent automatically-added tip. But then considering the source and the quality of the treatments you do get what you pay for. Our 90 minute massages (which we had the following day) proved among the 10 of the all time list of this spa snob-maven-diva whose indulged in pampering all over the world. We had reservations for dinner at Amaya, the hotel’s three meal restaurant, and decided it was best to boost our appetites with workouts in the perfectly equipped fitness center. Trust me when I tell you this hotel takes attention to details seriously. This Diva isn’t easily impressed and can be known to be a tad edgy at times. Our first meal at the Grand Del Mar was dinner at Amaya—an atypical three meal a day restaurant with a sophisticated setting. The experience proved flawless in every way, save for a slight problem with the air conditioning over our booth that left me chilly but was quickly remedied by the manager who brought me a shawl. Our meal was fabulous starting with Richard’s perfect martini and my glass of Lewis Chard. The food portion of the evening began for me with carpaccio of Balik salmon with candied onions and crème Fraiche and Richard’s Catalan-style shrimp with chile and lime broth, followed by braised short ribs cannelloni with beech mushroom ragout and a perfectly prepared veal chop and seared sea bass. We shared a cheesecake for dessert that was well worth the caloric splurge. The next morning we participated in thehotel’s complimentary nature hike around the adjacent Los Penasquitos Canyon Preserve. The 90-minute trek, led by a naturalist (Dylan) explores the natural wonders of one of the last remaining undeveloped coastal canyons in San Diego with its 500,000 year old soils of vernal pools to 140 million year old sedimentary rock deposits. We climbed and trekked through varying terrains lush with 500 plant species, sycamore trees, live oaks, scrub oaks, birds, brooks, and a boulder-studded waterfall with volcanic rock. This tour is not to be missed. We spend much of the afternoon in the Spa where I happily succumbed to the magical movements of David who worked out my sore muscles with 90-minute Athletic enhanced with aromatherapy oils, hot towels and much TLC. It was amazing. The evening was spent over a much anticipated, leisurely dinner at the award-winning Addison, a fitting showcase for noted chef William Bradley’s culinary skills dramatized by iron and glass doorways trimmed with 22 karat gold accent, 20 foot high pyramid ceilings, and a limestone fireplace imported from Italy. The restaurant receives regular raves not only from the media and pleased clientele, but the hotel staff each who are treated to Bradley’s multi-course menu. “It’s awesome,” beamed the valet who drove us from the hotel to the Clubhouse where Addison is situated. “You are in for a treat.” And we were. 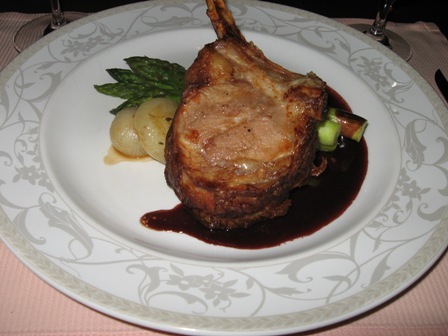 You can opt to let Chef design a 7-course personal feast or choose your own selections. We opted for the latter. It was all good from Richard’s Martini and my Lewis Chard (okay I love the stuff) to the amuse bouche—a fondue of Parmesan, champagne and cream with curried yogurt spiced with orange– and beyond. We tasted each other’s courses: butter baked salmon, rack of lamb, Japanese Hamache, Dover Sole, and pear confit ad black fig brulee with English bitter toffee. Each serving impeccable save for one episode where my salmon tasted like it fell in the salt shaker—apologies were proffered and a replacement made. I should point out that seasoning is left to the chef. No condiments are on the tables. None needed as recipes are fairly fussy and well sauced. Prepare to dine well and shell out at least $100 per person for a decent sampling with wines (of which there are many with a savvy sommelier (Jesse Rodriguez) to make suggestions and do pairings. 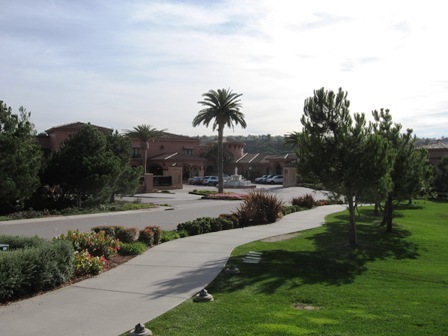 The Grand Del Mar sits inland just jorth of San Diego. 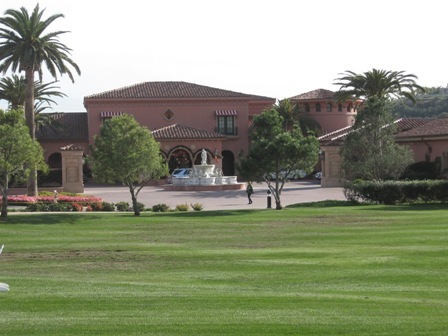 On site diversions include a Tom Fazio-designed championship golf course, tennis, the 21,000 square foot Renaissance-style spa, four swimming pools, and hiking, cycling and fine dining. Please check out the slide show as photos are definitely worth 1000 words. www.theGrandDelMar.com , 5300 Grand Del Mar Court, San Diego, CA. 858-314-2020. Christmas Eve – Thursday, December 24, served 3 to 11 p.m.
RH will offer a festive four-course menu featuring Chef Archambault’s own family recipes using California’s ingredients. 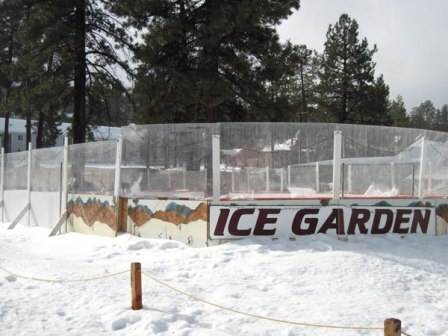 Price is $65 per person (tax and gratuity not included). Christmas Day – Friday, December 25, served 10 a.m. to 5 p.m.
Bid farewell to 2009 by indulging in Chef Archambault’s celebratory four-course New Year’s Eve menu. Reservations required. 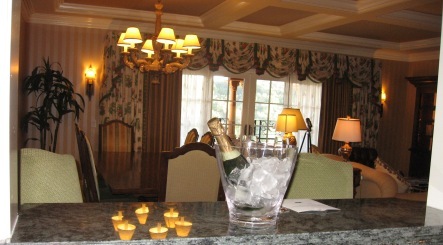 Price for the 1st Seating is $70 per person; 2nd Seating is $110 per person, which includes Champagne toast at midnight. Tax and gratuity not included. Enjoy brunch chased down by some detox cocktails such as a green smoothie, mint berry juice and fresh limonatta, or more adult beverages like RH BloodyMarys, Margaritas, Martinis or screwdrivers.